We’d love your help. Let us know what’s wrong with this preview of Germany 1866-1945 by Gordon A. Craig. To ask other readers questions about Germany 1866-1945, please sign up. Eine wirklich gelungene historische Darstellung. Beachtlich finde ich es bei der Materialfülle so komprimiert zu arbeiten und doch mitreisend zu bleiben. Es werden nicht nur die politischen Ereignisse dargestellt, sondern eine gesamtgesellschaftliche Skizze. Hier bestätigt sich, gute wissenschaftliche Werke müssen auch etwas literarisches haben. I read its predecessor in the series of Oxford History of Modern Europe: German History, 1770-1866, by Sheehan, which I found well written and insightful (although I do think Sheehan ignored all of the lower classes). I decided to read this book hoping it would be as educational as the other. So far, I am a little disappointed, but I am only 100 pages into it, so I am going to give it another 100 or so before I decide. How can you make such a fascinating topic so boring? Well, this is what Gordon Craig has achieved with his book on the history of Germany between 1866 and 1945. I would say two fundamental flaws let him down: his inability to convey the big picture and his style. The book is full of useless details whereas it lacks macro analysis and insight which would help understand why the history of Germany has moved in one direction or the other. As far as style is concerned, the example below summarises w How can you make such a fascinating topic so boring? Well, this is what Gordon Craig has achieved with his book on the history of Germany between 1866 and 1945. As far as style is concerned, the example below summarises what you have to go through for 764 pages: “Even now, in an age in which inflation has become a household word, it is difficult to convey a sense of the meaning of the plunging decline of the worth of the one commodity that more than any other serves man as a means of rational measurement of his situation.” What a pompous way of saying that the hyper inflation under the Weimar Republic in 1923 was an earth shattering experience for most of the German people. This is an excellent overview of the course of German history from the war between Prussia and Austria (and other German states) in 1866 until the conclusion of the Second World War. Although written in the late 1970s, this book stands the test of time and offers a very clear narrative of how Germany developed from unification until the utter destruction and degradation produced by the Hitler tyranny. There is a good blend of chronological analysis of the main political events and an excellent ex This is an excellent overview of the course of German history from the war between Prussia and Austria (and other German states) in 1866 until the conclusion of the Second World War. Although written in the late 1970s, this book stands the test of time and offers a very clear narrative of how Germany developed from unification until the utter destruction and degradation produced by the Hitler tyranny. There is a good blend of chronological analysis of the main political events and an excellent examination of key themes such as institutional structures, the role of religion, culture and the arts, and foreign policy. The book does not offer detailed discussions of the two world wars but these are not necessary in order to follow how the Bismarckian vision gradually diminished through the rule of Wilhelm II, the Weimar Republic, to the Third Reich. 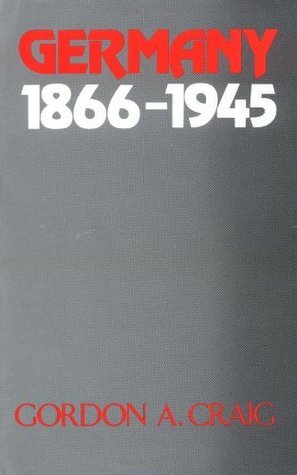 This is a great book providing a nice overview on German history in the years listed in the title. It's heavily focuses on the high level political history. The occasional forays into other areas seem a bit disjointed as a result. At times, it's a little dated. He easily dismisses that van de Lubbe caused the Reichstag fire, for instance, when most modern stuff I've read believes he clearly was lighting fires in the building that night. Some parts are a little annoying - like when he'll quote so This is a great book providing a nice overview on German history in the years listed in the title. It's heavily focuses on the high level political history. The occasional forays into other areas seem a bit disjointed as a result. At times, it's a little dated. He easily dismisses that van de Lubbe caused the Reichstag fire, for instance, when most modern stuff I've read believes he clearly was lighting fires in the building that night. Some parts are a little annoying - like when he'll quote something in German (or on a few occasions in French) and not translate it, just expecting readers to know what it means. (You'll see this in older academic works at times, so I guess it's a product of being dated). One of my study goals is to be able to understand the histories of individual states other than just the USA, Russia and the UK so as to be able to see world history from their perspectives. I haven't gotten far, but one good step in this direction was to read Craig's history of modern Germany. Another, later, was to read a history of Latin America written by a German historian which had been translated into English. I think I read this when everyone was on vacation except for me and Wolking and both of us were sick and did nothing but read and drink tea all day. I figured since I was in Germany, I should learn some history. Sadly, not too much of it stuck with me, but nevertheless, I remember the book being fairly interesting for a history book, particularly the part about the first world war. Easily the best book on German history until 1945. To be honest, it's a bit boring up until the first World War starts. Then it gets good. I'd recommend it for anyone who is very interested in German history....but not for anyone else. It's a bit dry unless you're really into the subject matter. Germany 1866-1945 was an excellent overview of the subject however, I felt that Craig's treatment of the Empire was a little myopic. His tendency toward the American view of WWI was more than a little obvious. I found his opinions regarding the Third Reich to be surprisingly even handed. There is no doubt that Hitler was pure evil but Craig gave the other 'players' quite their due. I have read several sections of this book and will read more as my research proceeds beyond 1933. It is very well written, unusually opinionated history which I have found both enlightening and enjoyable reading. One of the best general histories of Germany for the period from 1866 through the end of WWII. This is part of the Oxford History of Modern Europe series. Born in Glasgow, Gordon Craig emigrated with his family in 1925, initially to Toronto, Canada, and then to Jersey City, New Jersey. Initially interested in studying the law, he switched to history after hearing the historian Walter "Buzzer" Hall lecture at Princeton University. In 1935, Craig visited and lived for several months in Germany, to research a thesis he was writing on the downfall of th Born in Glasgow, Gordon Craig emigrated with his family in 1925, initially to Toronto, Canada, and then to Jersey City, New Jersey. Initially interested in studying the law, he switched to history after hearing the historian Walter "Buzzer" Hall lecture at Princeton University. In 1935, Craig visited and lived for several months in Germany, to research a thesis he was writing on the downfall of the Weimar Republic. This trip marked the beginning of lifelong interest with all things German. Craig did not enjoy the atmosphere of Nazi Germany, and throughout his life, he sought to find the answer to the question of how a people who, in his opinion, had made a disproportionately large contribution to Western civilization, allowed themselves to become entangled in what Craig saw as the corrupting embrace of Nazism. "Adolf Hitler was sui generis, a force without a real historical past... dedicated to the acquisition of power for his own gratification and to the destruction of a people whose existence was an offense to him and whose annihilation would be his crowning triumph. Both the grandiose barbarism of his political vision and the moral emptiness of his character make it impossible to compare him in any meaningful way with any other German leader. He stands alone"
After 1945, Craig worked as a consultant to the U.S. Arms Control and Disarmament Agency, the State Department, the U.S. Air Force Academy and the Historical Division of the U.S. Marine Corps. He was a professor at Princeton University from 1950–61 and at Stanford University from 1961-79. In 1956-1957, he taught at the Center for Advanced Study in the Behavioral Sciences. In addition, he often held visiting professorships at the Free University of Berlin; in 1967, Craig was the only professor there to sign a petition asking for an investigation into charges of police brutality towards protesting students. Craig was chair of the history department at Stanford in 1972-1975 and 1978-1979. Between 1975-1985, he served as the vice-president of the Comité International des Sciences Historiques. In 1979, he became an emeritus professor and was awarded the title J. E. Wallace Sterling Professor of Humanities. During his time at Stanford, Craig was considered to be a popular and innovative teacher who improved both undergraduate and graduate teaching, while remaining well liked by the students. After his retirement, he worked as a book reviewer for the New York Review of Books. Some of his reviews attracted controversy, most notably in April 1996, when he praised Daniel Goldhagen's book Hitler's Willing Executioners and later in September of the same year when he argued that David Irving's work was valuable because of what Craig saw as Irving's devil's advocate role. Craig argued that Irving was usually wrong, but that by promoting what Craig saw as a twisted and wrongheaded view of history with a great deal of élan, Irving forced other historians to fruitfully examine their beliefs about what is known about the Third Reich.